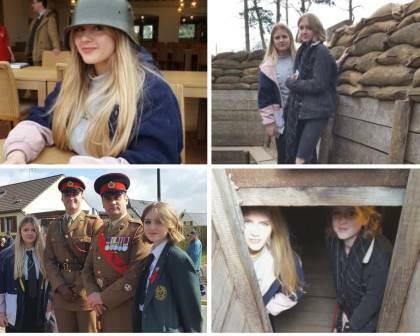 Before Easter Molly & Mia from Y10 visited France and Belgium to pay their respects to the men of the Manchester Regiment who lost their lives 100 years ago at Manchester Hill. Both students love history and were blown away when they realised they would be visiting a place they has studied about and see it with their own eyes. You might recognise Mollie as they eyes of the nation were upon her when she was asked to lay a wreath at the memorial service on the final day, “I was so nervous as there were hundreds of pupils from other schools in Manchester as well as TV crews from ITV and the BBC, I feel honoured to have been selected and proud I represented Cedar Mount”. Both girls agree it left them emotional and moved but it was an amazing experience to have been part of and will remember it as being the best school trip ever!